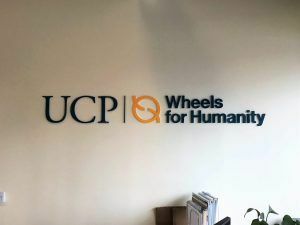 Last week we blogged about the new building sign we made and installed for UCP Wheels for Humanity, a non-profit organization that delivers mobility solutions to people with disabilities in developing countries. Today’s blog will be focusing on the interior sign we did for them. We were originally contacted to just make their new exterior dimensional letter sign, but while going over different options for the building letter sign, they started to become interested in a lobby sign also. 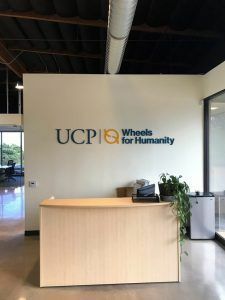 Many companies will get an indoor sign that displays their logo in the lobby area of their business to create corporate identity. Having a high-end display of your logo be the first thing someone sees when they enter your business leaves a great first impression. If your company has an established logo, you want to make sure that it looks the same in all of your marketing. We took the same logo format used for their building sign and also used it for their lobby sign. Since their building sign was made from individual, dimensional letters, we decided to use the same style for their lobby sign. The only difference was the material. They specifically requested foam dimensional letters for the building sign but for the lobby sign, we decided to go with acrylic dimensional letters. Acrylic is higher quality than foam, but foam is more affordable if you’re trying to create very thick letters and it is also very lightweight. We prefer to use acrylic for a lot of our lobby signs because it comes in many different thicknesses, colors, and can even be painted. If a company has very specific colors in their logo, our go-to is acrylic. After routing out the different components of the logos and the different letters, the pieces are painted any Pantone color you request. If acrylic comes in the colors you need for your sign, we can just flat cut the letters out of the acrylic as it is. Check out some examples here. We can also install the letters directly onto the wall, or apply them to a backer and the whole backer gets installed as one piece. We usually use acrylic for the backer also. Most commonly, we use clear acrylic for the backer. We can keep is clear or apply etched vinyl to the back which gives the whole sign a frosted glass look. This is a good option if your logo might blend in with the color of the wall the sign is going on. These are just a few options of lobby signs, feel free to check out our website for more photos. If you’re ready to start on a lobby sign project, you can request a quote here.